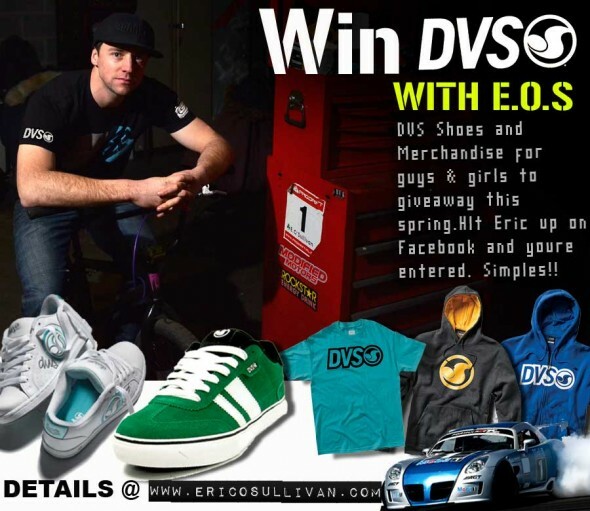 2009 Formula Drift Rookie of The Year, Eric O’Sullivan, has teamed up with his good friends and sponsors at DVS Shoes to offer drift fans a shot at winning a collection of DVS gear. The winner will receive new DVS Shoes & clothing to ensure he/she is freshly dressed for the start of the 2010 Formula Drift Season. Its free and easy to enter the competition, here’s the deal. All you need to do is sign up for the Eric O’Sullivan news letter. Those that register between today and end of February will be put into a hat and one winner will be picked at random. The winner will receive a fresh pair of DVS Shoes, new DVS hoodie and Tshirt + some other bits and pieces that we can manage to squeeze into the package. To sign up to Eric’s email subscription you can click here. The email address that you submit will receive an activation email. Usual process, click the link contained within the activation email and you’re all done. This competition is open to international audience, postage & packaging is included in prize. Best of luck to all subscribers.